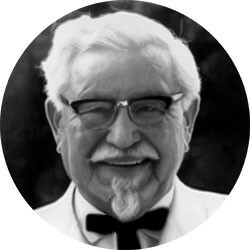 Famous Failures Colonel SandersBorn in 1890 in Indiana, Colonel Harland Sanders, the founder of Kentucky Fried Chicken (KFC), is famous not only for his chicken recipe, but also his numerous failures in life and in business. At the ripe young age of 5-years old, his father died, leaving only his mother to fend for and support three children, including Harland. While his mother left for days on end, Harland was forced to help take care of his siblings and became a proficient cook during this time, learning how to make bread and vegetables and advancing in his knowledge of cooking and preparing meat by the age of just 7-years old. By 10-years old, he was already working as a farmhand. In 1902, at the age of 12-years old, his mother remarried, subjecting the children to an arduous environment that ultimately forced Harland to leave home the following year. By 14-years old, he began working as a farmhand at another farm in Southern Indiana. Sanders worked odd jobs for years, never really able to make anything stick. He owned a ferry boat company on the Ohio River, sold tires in Winchester Kentucky, and later, in 1930, opened a restaurant inside a Shell Oil Company-owned gas station in North Corbin Kentucky where he began serving chicken dishes. He was 40-years old at the time. In July 1939, he came to own a motel and a restaurant, which was destroyed by a fire just 4 months later. But it wasn’t until 1940 when he began to finalize his so-called “secret” chicken recipe, at the age of 50-years old. However, in 1942, during the war, he sold his business and subsequently got divorced in 1947. In 1955, another one of his restaurants failed after an Interstate route that led traffic past that restaurant, was changed. That year, with just a $105 social security check to his name, at the age of 65-years old, he set out to sell his franchised-chicken model to restaurants across the country. He was famously rejected by 1,009 restaurants before one agreed to his idea.